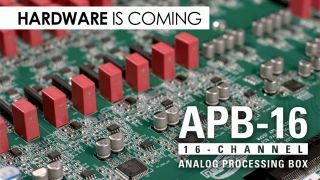 NAMM 2019: In what it’s calling a world-first, McDSP has developed the APB-16, a 16-channel programmable analogue effects box that can be controlled in software. Early specs indicate that Pro Tools will definitely be supported; it remains to be seen if compatibility with other DAWs will be forthcoming, too. We’re hoping to get a sniff of the APB-16 at NAMM. Early details are available on the McDSP website.